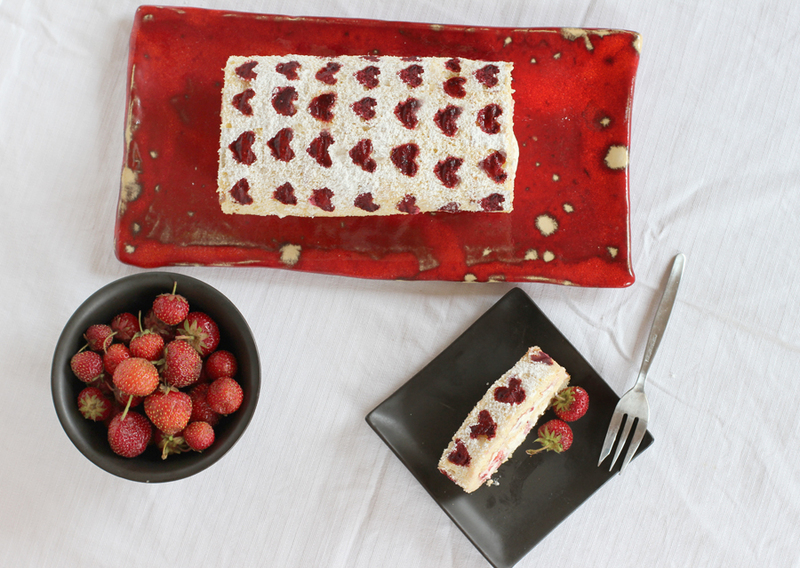 After I saw the fantastic rolling cakes with hearts over at Dulce Delight I wanted to make it. Of course I didn’t watch the video. That’s not how I work. That would be to easy. That would be no challenge. So I had my own go at what I thought could work. And it did. It’s not as neat as the one from Raiza but I made it! Combine all ingredients until you have a smooth and gooey dough. Then I cut a stripe of my silicone mat (it’s about 1 or 2 mm thick) that I use for baking or rolling out cakes and cut out 5 little hearts in a row. This was my template for the hearts. I put some baking paper on a baking tray and spread the dough thinly over my template. Pull it off and do the same in the row below. And again and again. Until you have a field of neatly hearts. I popped it into the freezer and preheated the oven to 180° C.
The dough will be to much for this little cake. In order to not waste the ingredients, I made a bigger heart template and spread the dough on a separate baking tray lined with baking paper. It needs only 5 mins baking and you have very pretty decoration for any cupcake or dessert. Now prepare the sponge for the rolling cake. Beat the egg yolks with 40 g of sugar and the vanille sugar until it is light yellow and fluffy. Mix the egg whites with the rest of the sugar until stiff. Combine both slowly and sieve in the flour. Take the baking tray out of the freezer and spread the mixutre on the frozen hearts. Bake in the oven for 20 minutes. Sieve some sugar on a baking paper on your kitchen counter. Remove the baked cake from the pan onto this paper. Peel of the waxed paper that was in the oven. The hearts should be visible. Turn the cake around so the side with the hearts faces the sugared baking paper. Starting with the short side roll the warm cake into a spiral and let it cool. Cut 200 g of the strawberries into little pieces, mix the other 100 g in a blender in order to get strawberry puree. Beat the cream and add the vanille sugar. Mix carefully with the strawberry pieces. 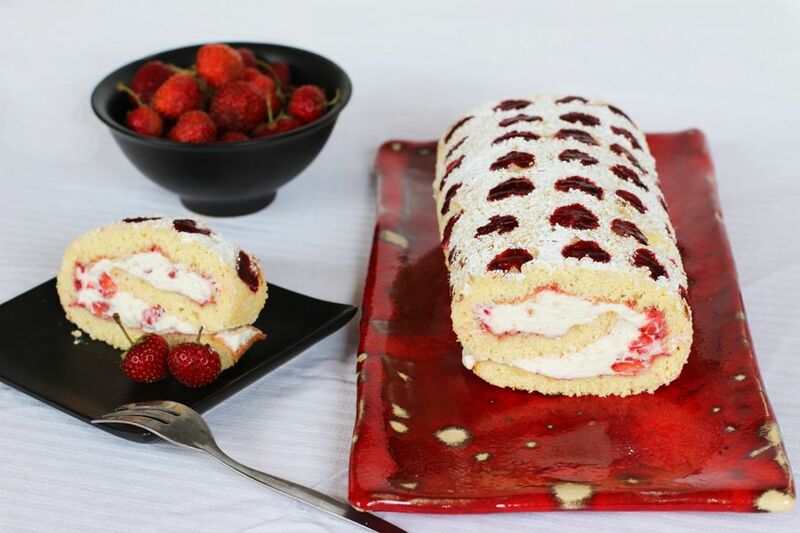 Unroll the cake carefully and spread the puree over the whole cake. 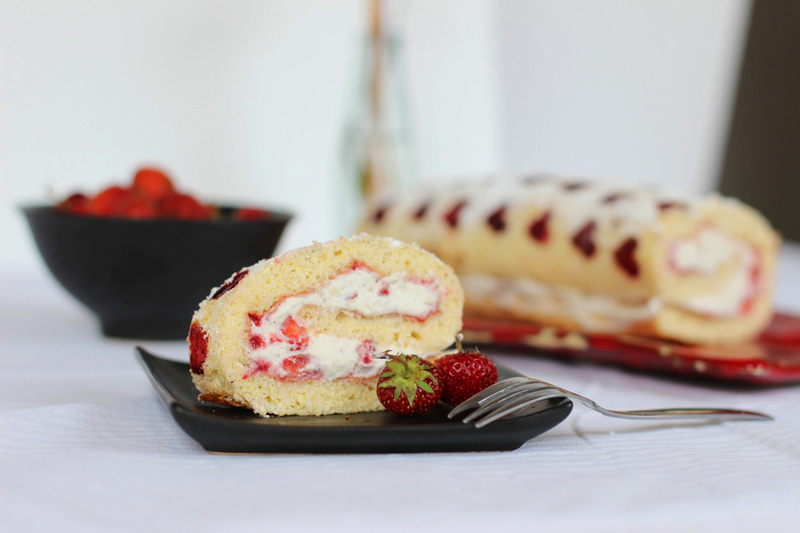 Add the strawberry cream and roll the cake back into its spiral. To make it look even better I put a few drops of water with a tiny brush over the hearts and sieved powdered sugar over the cake. The water will dissolve the sugar immediately where the hearts are. This leaves the rest of the cake under a fine coat of sugar. Now look what I made! This is a proud day! Or night, since I the whole process started around 9 pm. And another picture from above that shows the cute heart pattern. Photo model with a clutch. This is one of the cutest most delicious thing I’ve seen. Cool breakfast. | Look what I made! Top 10 of 2013: Recipes. | Look what I made! Valentine’s Day Ideas. | Look what I made!